"I've been playing guitar for more than 20 years. 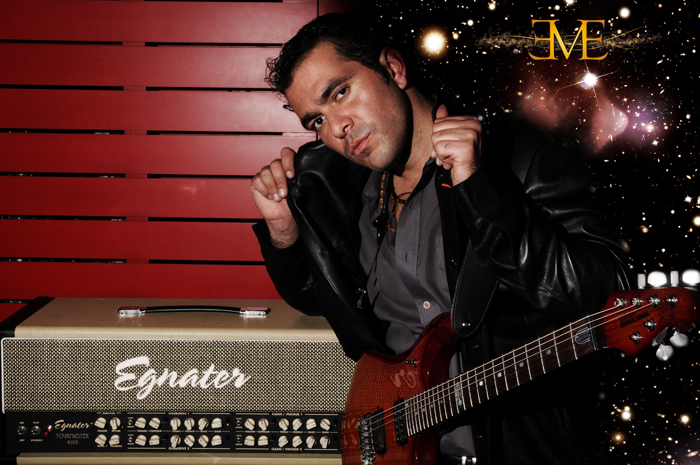 I have performed live and studio with many amplification brands searching for the perfect tone until I found Egnater. Egnater amps have the whole guitar spectrum; great tone and fidelity from crystal clear guitar to monster roar hi gain distortion. It's the most exciting amp on the market!" Enrique was interested in music since he was a 3-year-old kid. Piano student since he was 6 years old, he turned to guitar at the age of 13, since then he’s been studying with different teachers’ world wide from classic guitar and flamenco, to rock and jazz to achieve a unique sound. Enrique show a very creative musical sense since he started composing and creating songs. From his first band to his actual project he has been the creative mind. Formally known as Tonica´s guitar player, axe man and song writer. In 2005 Tonica won as best Mexico’s new rock development at the San Remo Music Awards. Maroto has participated in film score, album producing, song writing, arrangement, and guitar playing in many albums and live performances in Mexico and Latin America. Enrique´s music style can de defined as a strange mixture of funk, rock, jazz, bossa and folklore. He draws from an eclectic variety of sounds and influences. Maroto's technical guitar playing is influenced by many different guitar players who have key attributes in their playing, that have rubbed off on Enrique such as Eddie Van Halen, Nuno Bettencourt, Al Dimeola, Paco de Lucia, Tom Morello and Bryan May, while his solos and sense of melody are influenced by Vito Bratta and Richie Kotzen. He is particularly adept at arpeggios articulated via string-skipping tapping. One of the strongest elements in Enrique´s playing is his sense of rhythm, often using a very loose wrist technique to execute fast triplet picking licks to create a funky sound to his rhythm playing and also his use of poly-rhythms to blur bar lines and create a unique sound. Enrique Just released his first solo album called “Estrella Eléctrico Amarilla” which is an exquisite piece of guitar art work. He is now on tour promoting this material inside México and 2011 he will be visiting important cities of the US, México, Central and South America.